The way we run Bishopton Basketball Club very much echoes the Globetrotters’ message of C.H.E.E.R. (Co-operation, Healthy minds and bodies, Effort, Enthusiasm and Responsibility). And, like the Globetrotters, we embrace a strong sense of community and constantly strive to give something back to the game. So, you can imagine that it is with considerable pride that the Broncos can claim to have met the world famous Harlem Globetrotters in person! 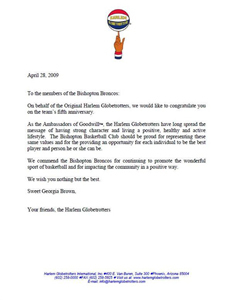 This was arranged with the Globetrotters’ management team in advance of their visit to Braehead Arena on Thursday, 17 May 2007 during their 2007 UK Tour. After getting our photo taken with the team just before they took to the court, we settled down to watch the amazing spectacle of skills that typifies any Globetrotters show. Given our large membership, we made our mark by taking over a significant part of the arena, kitted out in our club gear. Not only did we meet the players, we were also able to celebrate our shared values by presenting the Globetrotters with some of our club’s merchandise courtesy of our corporate gear suppliers, LogoWear of Glasgow. So, somewhere in Harlem, there’s a Globetrotter wearing the only XXXXL Bronco hoodie in the world! Check out some of the photos from this memorable occasion. Due to the success of our earlier outing, we were able to take another large contingent along to Braehead Arena on Thursday, 15 May 2008 during the Globetrotters’ 2008 UK Tour. Once again, we claimed a large section of the arena as our own! The Globetrotters’ opponents put on a great display, too, and looked to be threatening to spoil the show. Who are we kidding? There was only going to be one winner, and the guys in the stars and stripes really turned on the style during the final session to clinch a convincing victory. 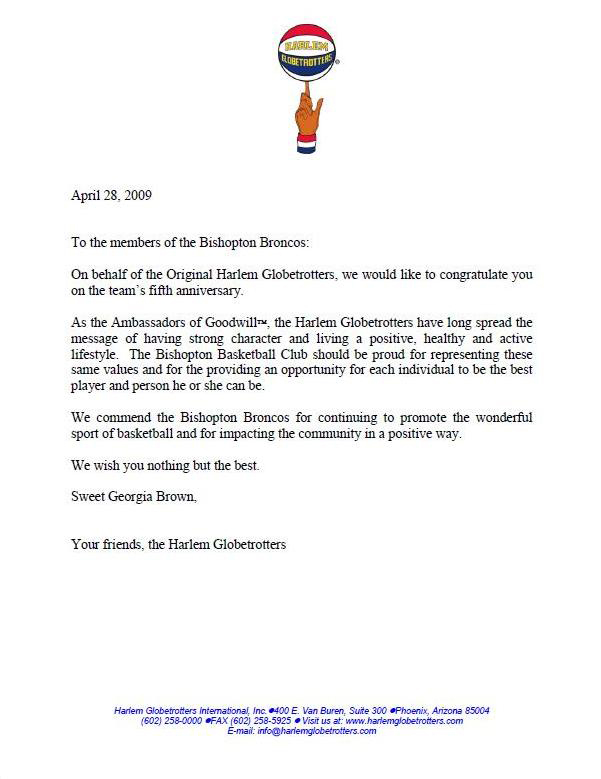 Our link with the Globetrotters continued with their much appreciated good wishes and congratulations when we celebrated our 5th birthday at the end of April 2009. As well as our members clearly enjoying these outings, the Broncos have earned consistent praise from the training squad who commended our members for their hard work, enthusiasm, attitude and exemplary behaviour. On our first outing in 2006, we had over 20 players participating in the event, all of whom really had a great time trying out some new drills and techniques. With many of our members sporting their Broncos’ corporate gear, we made a real impact during the outing. Ryan Hunter was awarded “Most Valuable Player” by the training squad and had the honour of being the Rocks’ mascot for the game later on in the evening. We came away with a handful of other awards and David Kilpatrick and Rhona Sloss ended up going head to head in the final of the half-time shoot-out, Rhona narrowly edging the overall victory. What a day for the Broncos! We repeated the event in December 2006 with a similar amount of success to our first trip. This time we had over 40 players attending, with transport kindly supplied by Arriva Buses. Rhona Sloss repeated Ryan Hunter’s last year achievement of Most Valuable Player and team mascot double, with Laura Brown also appearing as a team mascot. So, another clutch of awards headed in the Bishopton direction. The Rocks even topped off another successful day for us with another home win. Of course, as well as enjoying some first class training, we’ve also taken the opportunity to take our players along to some key games for the Rocks, including their first ever live televised match against MK Lions at Braehead Arena on 25 April 2008. A large contingent of Broncos and their families made up part of the record breaking crowd of 2,417. Sunday, 7 February saw our first chance to see the Rocks at their new home in Kelvin Hall Glasgow when they played Worthing Thunder. After a nervy start, the Rocks soon took command and were never really threatened as they chalked up another victory. At the end of the match, recognising the enthusiastic support from the large Broncos’ contingent, the Rocks management team invited us on to the court for a group photo at their new venue. The New Year got off to a great start on Sunday, 9 January when around 40 players plus Coaches and Committee members joined the Glasgow Rocks for one of their recently-resurrected Match Day Specials. Big thanks to Arriva for providing the bus to get us all to the Kelvin Hall and safely back again despite the icy conditions. Our players were soon on court, being put through their paces in a much appreciated lengthy session which provided a varied selection of skills training. 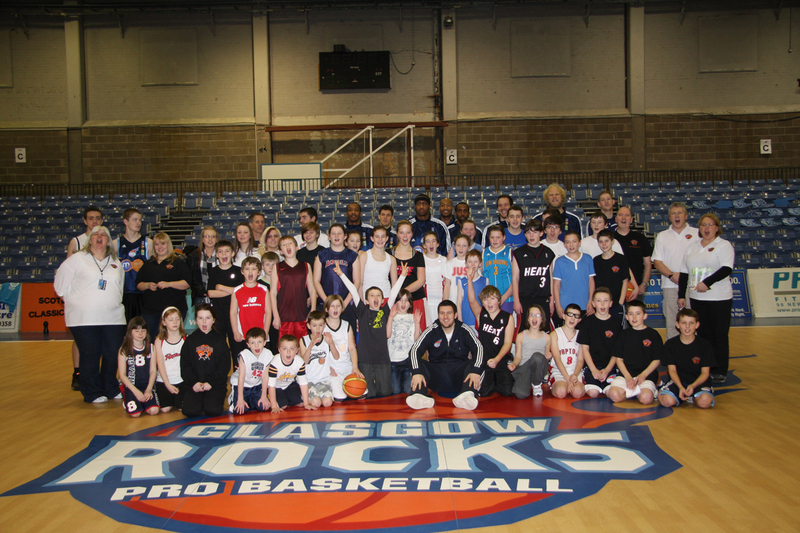 Huge thanks to Scott Russell, Glasgow Rocks Guard, who personally presided over the whole session, ably assisted by other members of the Rocks’ squad. By the time tip-off came, with the arrival of friends and relatives, the Broncos had taken over a block of almost 90 seats in the arena! The Rocks rewarded our enthusiastic support with a 88 – 81 victory over Leicester Riders in the BBL Championship to cap off another brilliant event for the Broncos! With transport again being provided by our friends at Arriva, we travelled to the Kelvin Hall on an unusually mild November Sunday afternoon. Responding to the customary healthy number of players brought along by the Broncos (including friends from Renfrew Rocks and Johnstone High), the Glasgow Rocks training squad set up a number of stations for players to visit on rotation. Although we’ve come to expect it by now, it was great to see the enthusiasm and application of our players as they grabbed this chance of a different slant to their weekly training sessions. Despite it being a pretty intense workout, there was a host of smiling (and red) faces by the end of the one and a half hours. There was just time for a welcome break to take in food and fluids before joining in with the rest of the spectators with a minute’s silence for Remembrance Sunday immediately prior to the Rocks’ match against Sheffield Sharks. This was a televised event filmed by Sky Sports and you couldn’t help but notice the Broncos contingent, most in Broncos kit, who, swelled by families and friends, took up a huge block of 110 seats to cheer on the home side. Once again the Rocks didn’t disappoint, completing an impressive 82-64 victory despite a very close first half. And to further put the Broncos stamp firmly on the day, Liam Stevenson came away with a signed match ball after his success in the half-time shoot-out. Yet another special day for the Broncos and huge thanks go to the Committee and Coaches who gave their time to organise and staff the event.